This bottle had no foil on it, just a blob of wax. Apparently this is the new thing. Why do wine bottles even have foil around the tops of them in the first place? To keep out critters who might burrow through cork and get into the wine. I sort of prefer no foil. It’s easier to get to the wine. Those critters know goodness. While researching the winery, I learned that Matello means “a little crazy,” which of course, speaks to me. We all need all crazy in our lives. Matello Chardonnay, where is it from? Personally, I like the non-cork corks. They don’t break, but that’s for a different blog post. Matello winery is located in the Willamette Valley in Oregon. This is a wine region that has gained in prominence over the last 10-15 years. When I bought the wine, I did so on the recommendation of the owner of the wine shop. I wanted a good Chardonnay and was willing to pay +/- $30 for it. Sometimes, a gal wants to try a wine that is outside her usual price point. Here’s the thing, I’m from California. We don’t have to let our wines age. As soon as the winery sells them, they are ready. So, it didn’t even occur to me to store this sucker away for future drinking. Usually, I let my wines breathe or decant or whatever you want to call it. Mostly because I’m multi-tasking otherwise known as distracted. 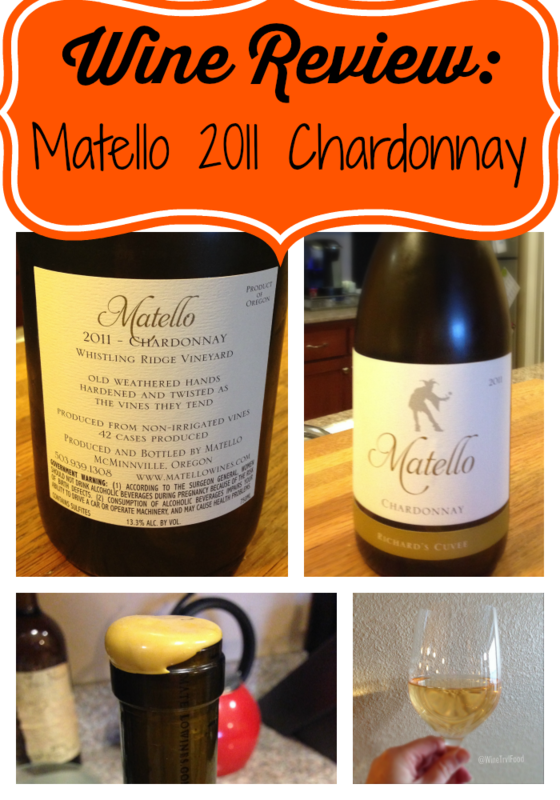 Matello Chardonnay, how did it taste? Very clean, crisp with a slight buttery aftertaste. It wasn’t overpowering, it was friendly. Did I taste something lemony? There was definitely a hint of citrus.